Different salts contain different metal ions (charged particles). When solutions of these salts are heated in a Bunsen burner flame, they give off characteristic colours. For example, sodium ions make the flame turn yellow, the same colour made by sodium street lamps. 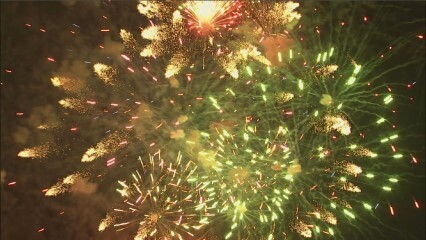 The different colours in these fireworks are caused by different metal ions. You can be an analytical chemist or forensic scientist in this activity. You can discover the different coloured flames made by metal ions, and use these to work out the identity of the metal ions in some 'unknown' salt solutions. First make sure that you have a clean flame test wire. Do this by holding the metal loop in the hottest part of the Bunsen burner flame. If it is clean, there should be no change in the colour of the flame when the metal loop is put in it. If it is not clean, clean it by dipping it into the concentrated acid provided, then holding the loop in the Bunsen burner flame. Repeat this cleaning until there is no more change in the colour of the flame. The next job is to do your flame tests. Dip the flame test loop into one of the known test solutions, then hold the metal loop in the edge of the Bunsen burner flame. Make a note of the colour of the flame on your Flame Test Chart (a simple version is shown below). Clean the flame test wire, then test another known test solution. Keep going until you have recorded the colour of all of the known solutions. Get your results checked. Carry out flame tests on the unknown solutions. Make a note of their flame colours on your Flame Test Chart (a simple version is shown below). Compare the flame test colours so you can work out which metal ions are present in each unknown solution. We investigate lithium, sodium, potassium, calcium and copper(II) salts. They give readily identifiable colours and are specified for GCSE courses. Solutions are safer to use than solids, although both work in flame tests. The activity is most easily carried out using different stations, one for each solution and with labelled flame test loops. This avoids the need to clean the flame test loops, and is desirable if adequate supervision of the students cannot be obtained. If required, the flame test wires can be cleaned between each test by dipping in hydrochloric acid and heating. Sodium ions in particular are difficult to remove, and students will end up thinking everything contains sodium or makes a yellow flame! The expected colours are shown in the table below. Irritant to the skin, eyes and respiratory system. Wear eye protection. Avoid skin contact and do not inhale the vapour. At a concentration of 0.5 M, these metal chlorides are low hazard. Note that 0.5 M copper(II) sulfate is corrosive to the eyes and irritant to the skin, so copper(II) chloride solution is preferable.